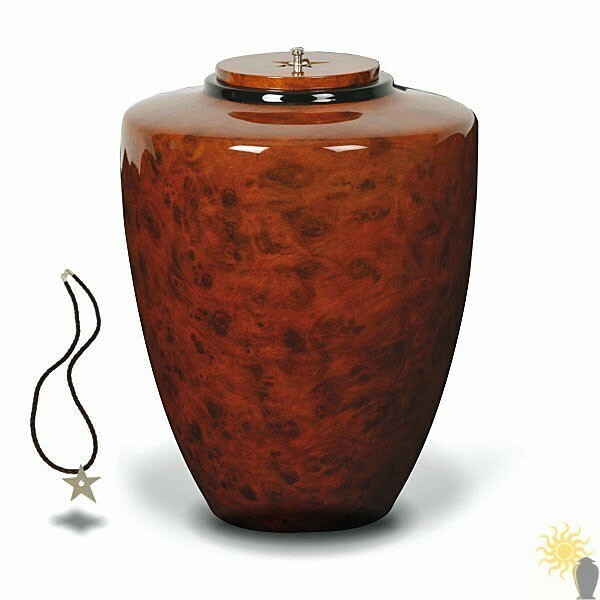 This urn has an additional surprise, because it is supplied with a keepsake necklace. In the lid of the urn is a little star shaped pendant, which ordinarily is just a decorative element of the urn. However, this star shaped element can be unscrewed and threaded on the cord chain that comes supplied, and worn around your neck, so that you always have a connection to the precious ashes in the urn. Please note that this pendant does not hold any of the ashes. CAPACITY - Approx: 213 cubic inches or 3.5 litres. Due to the variables present in the cremation process, we can only estimate that this urn is suitable for the ashes of an adult of approx. 97kg or 16 Stone.